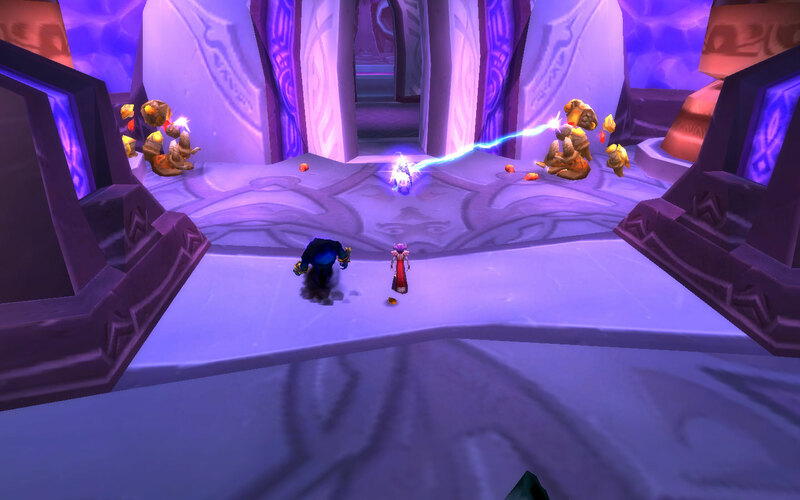 When we last left Madorsa, Averry had just run her through dungeons in Zangarmarsh so she could escape having to wait for respawns because of the overcrowded climate caused by Cross Realm Zones. She moved over to Terrokar, and the questing was a little better at first. She had her choice of killing Arakkoa in two places, Blood Elves at Firewing Point, Orcs at a couple of different places, or wolves and warpstalkers in between. This goes well when you have so many options. Where it doesn’t go well, is when you have cleared up a couple of those and have no choice but to watch in despair as 5 or 6 other people camp spawns and tag everything as soon as it pops. I managed to get her to 65 and then I just couldn’t take any more. I found myself looking at her on the login screen and just exiting the game rather than attempting to do anything. I had to find a way to get past this. I think if I had it to do over again, I’d have gone ahead and just leveled on Drak, PvP flag be damned. 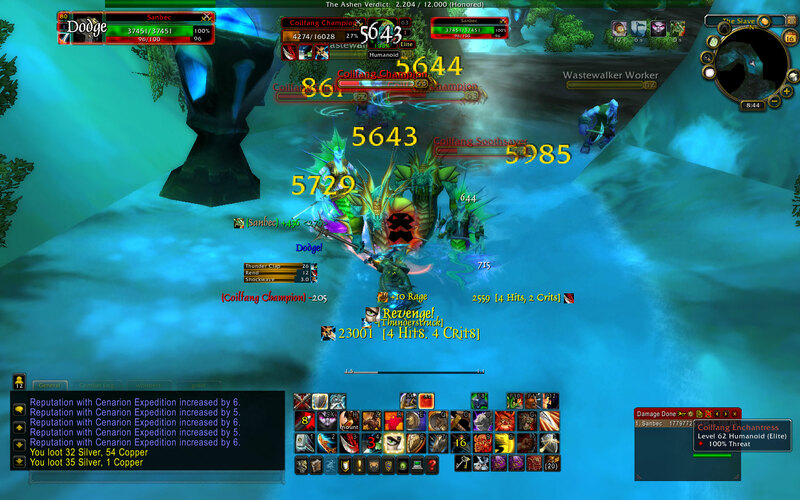 At least then I could take out my frustrations on the Alliance who are in my way killing my quest mobs. So yesterday, I decided to take her back to Azeroth for some archaeology and pet battles. Hey, xp is xp. Averry has been trying to convince me that dps queue times for dungeons aren’t too bad, as his monk isn’t too far ahead of me in levels and recently went through all the same dungeons I would be doing. But … the thought of doing them as dps just … I mean … I *know* it doesn’t make sense to be more scared of doing dungeons as dps than I would be if I were tanking or healing, but … I never claimed to be normal. I got almost a full level, plus got my arch up over 225 AND got a flawless battlestone. Then I had to log over to Kerick for LBR. So while I’m doing that, Averry starts texting me, asking what level I am now and when I tell him, he proposes hitting up the Auchindoun dungeons later. I’m like … yay! 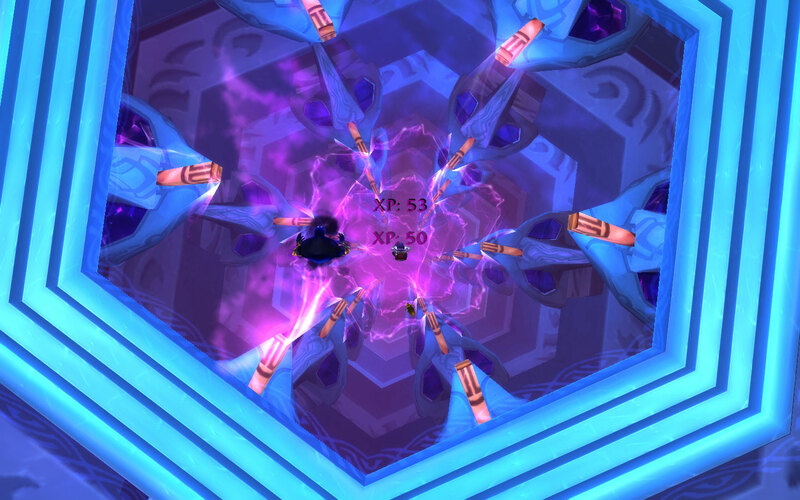 So after LBR I finished getting to 66 while I waited for him to log on, then we went and did all four of those dungeons. That got me to 67, and I figured that we were done. But he’s all like … what can we hit next? Um … well, I just had Steamvaults and Botanica unlock. So he says ok let’s go to Netherstorm and starts to fly off. Um … you know I have slow flying, right? Just hit up the flight path. Yeah … I don’t have any flight paths there, they removed automatic flight path learning in the last patch. So he gave me a ride. But … we forgot about that fun little CRZ 2 person mount bug. As soon as we crossed the line into Hellfire, I was disconnected. When I reconnected, I was falling, and landed right on Razorthorn Shelf, amidst a crowd of level 70+ flayers. Not even a youngling spawn to make it worth it. Of course, I panicked and forgot all about my damage reduction abilities, of which there are many. So I died. 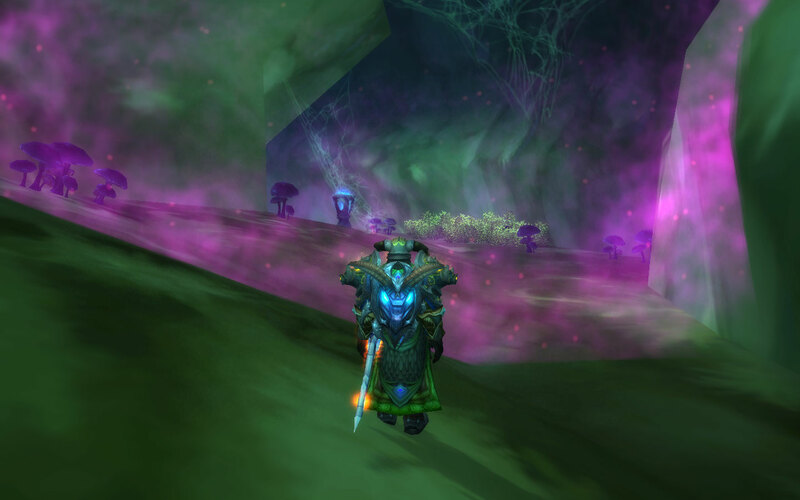 I was ready after that to just fly on my own across the twisting nether, but he insisted we just go the long way around and, with him staying close to the ground as we crossed borders, we managed to not have me dismounted again, although I was disconnected twice more. Riding from Zangarmarsh into Blade’s Edge through the tunnel didn’t dc me though. Finally we arrived at Tempest Keep, and hit up Mechanar, Botanica, and the Arcatraz. I dinged 68 before Arc, but since we were there we did it anyway. Plus, I think Averry was having fun gathering as many mobs as he could and seeing how nice of a pile he could make with them. I got quests to complete in every dungeon we did except for Shadow Labs. Now I’m ready to hit Northrend, and I think I got enough mats to level my professions up to 350 or so. I know I have enough cloth at least. Cross your fingers and pray that Northrend leveling will be better. At least there I have more than one zone to choose from per level. I may bounce back and forth. I mentioned earlier in the week that Sanbec finally decided to try out that tank spec he’s been sitting on since dual spec was reduced to 100g. Let’s pick up the story where I left off in that other post. So, I grabbed Sanbec to go along to Shadow Labs with Chan and a couple of level 70-somethings. Sure, we could have done it fine with Chan and Kar, but I figured since the lower levels would be drawing aggro from everything, it might be safer to have a plate class along, even one that doesn’t really know what he’s doing. I didn’t take time to pull my gear out of the bank. With the way things are now, I’m uncrittable from talents, plus, you know … it’s Shadow Labs … on regular. As long as I have the 1H and shield, I’m good to go .. plus stuff will die faster. Now, obviously, I know how to tank. (some of the people in the 5 mans Kaly has tanked might disagree though) So it wasn’t a matter of learning how to tank, so much as it was learning what abilities I have and what buttons to push on a warrior. Charge, rend*, thunder clap … maneuver stuff around if necessary to get it all in front of me and …. BAM! shockwave! Oh look, revenge procced. Hit that, then a shield slam, ooh another revenge and … what’s this? Sword and Board?? Oh, you like the taste of the shield so much you wanted another shield slam, eh? Ok! That pretty much covers trash. Maybe throw some devastate in on bosses to get sunders up. Shield bash crap that tries to cast spells, heroic throw if a caster somehow ends up out of melee range. It does take a little more finesse to group things up on the warrior … it’s not like I can just death grip stuff to me like Kaly can. But once they’re where I want them …. well, I giggle a little bit every time I do this …. After we finished in Shadow Labs, I went on my own to Underbog. I cleared that out, then the next night I did Slave Pens and Steamvaults. Wednesday night I did Escape from Durnholde (aka Old Hillsbrad). Later the same night I went to Old Hillsbrad on Kaly. He didn’t worry so much about positioning … drop a DnD and hit Blood Boil as many times as you can and stuff is stuck on him from all directions. Sure, he steamrolled it just as easily if not even more easily than San, but … teh shockwave, it is teh fun! *I know at least one person who thinks that the Blood and Thunder talent (spreads rend to all targets within range when you thunder clap) is not worth picking up for prot. My position is this … he’s talking about threat building/survivability for raid tanking and says it doesn’t do enough threat to make it worth spending points in. Well, that’s fine, but … I’m not raid tanking right now … I’m soloing old content. Therefore, the more AoE damage I can put out, the better. Also, from the sound of things, prot may be the way to level in Cata, so again … the more damage I can cause to whatever I’m killing, the better.